What Does Gleaning Mean In The Book Of Ruth? If you have ever read the Book of Ruth you can probably recall her gleaning so what does this have to do with the Christian today? 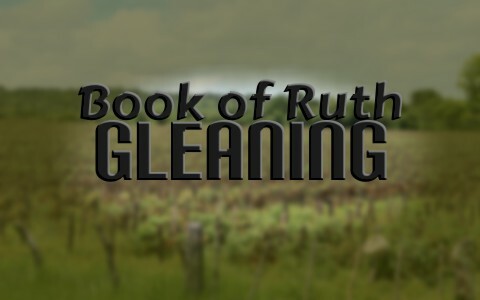 What can we learn from Ruth’s gleaning in the harvest field? The Book of Deuteronomy gives ample evidence that the poor, the widows and orphaned, and even the strangers or sojourners should have a way to feed themselves and this law was given to those who were the owners of the fields and groves and again shows God’s concern for those who are unable to provide for themselves. In Deuteronomy 24:19-22 we read “When you reap your harvest in your field and forget a sheaf in the field, you shall not go back to get it. It shall be for the sojourner, the fatherless, and the widow, that the Lord your God may bless you in all the work of your hands. When you beat your olive trees, you shall not go over them again. It shall be for the sojourner, the fatherless, and the widow. When you gather the grapes of your vineyard, you shall not strip it afterward. It shall be for the sojourner, the fatherless, and the widow. You shall remember that you were a slave in the land of Egypt; therefore I command you to do this.” This allows the fatherless, the widows, the poor, and even the sojourners to have sustenance when their means of support is gone. This reflects the tender mercy of God on those who have little or nothing due to circumstances beyond their control. If the producers do allow some of the produce to remain in the fields or on the trees God has said it would be so “that the Lord your God may bless you in all the work of your hands.” The failure to do so would also remove the blessing of God on those who produce the harvests but was also a punishable offense. We can read in the Book of Ruth how this law was able to support those who had been widowed in Ruth 2:1-2 “Naomi had a relative of her husband’s, a worthy man of the clan of Elimelech, whose name was Boaz. And Ruth the Moabite said to Naomi, “Let me go to the field and glean among the ears of grain after him in whose sight I shall find favor.” And she said to her, “Go, my daughter.” Since Ruth was a Moabite, she would have been allowed to glean parts of the leftover harvest since she was also a sojourner or stranger (Deut 24:19-22). So Ruth “set out and went and gleaned in the field after the reapers, and she happened to come to the part of the field belonging to Boaz, who was of the clan of Elimelech. And behold, Boaz came from Bethlehem. And he said to the reapers, “The Lord be with you!” And they answered, “The Lord bless you” (Ruth 2:2-4). Boaz noticed this young woman and asked who she was (Ruth 2:5) and Boaz’ servant said “She is the young Moabite woman, who came back with Naomi from the country of Moab. She said, ‘Please let me glean and gather among the sheaves after the reapers.’ So she came, and she has continued from early morning until now, except for a short rest” (Ruth 2:6-7). Boaz made sure she had more than enough and so “Boaz instructed his young men, saying, “Let her glean even among the sheaves, and do not reproach her. And also pull out some from the bundles for her and leave it for her to glean, and do not rebuke her” (Ruth 2:15-16). Believe it or not, the custom of allowing the poor to glean in the grain fields and vineyards is still practiced by generous landlords in some parts of the world such as in Syria. Sometimes the owner will send a helper to glean what remains to be given to the poor and the appointed “watchmen,” who is like a sort of security guard over the fields, groves, or vineyards, allow the poorest of the poor to glean what the harvesters missed. Sometimes a gracious owner will intentionally instruct his workers to leave some of the produce so that the poor can harvest it and provide for themselves and their families. I believe another reason for the allowance of the gleaning is for the purpose of the poor being able to provide for themselves without the embarrassment or humiliation of having to beg for life giving sustenance in the hopes of preserving their dignity. There is still a harvest going on and the Lord God is gleaning the corners of humanity but it appears to be only the corners of the fields that are left as Jesus said “many are called, but few are chosen” (Matt 22:14) and so we must understand that “The harvest is plentiful, but the laborers are few; therefore pray earnestly to the Lord of the harvest to send out laborers into his harvest” (Matt 9:37-38). Sadly, most Christians (less than 1 in 10) have ever entered the harvest fields even once. Even so, there remains a faithful remnant and God is yet gleaning the fields of human souls and reaping only those who have repented and trusted in the Harvester. Is that you? I pray it is. I’m not sure why most Christian woman that I have encountered was so caught in Boaz, when this story was clearly about Ruth. Previous post: What Are The Twelve Tribes Of Israel?